Look at these!! 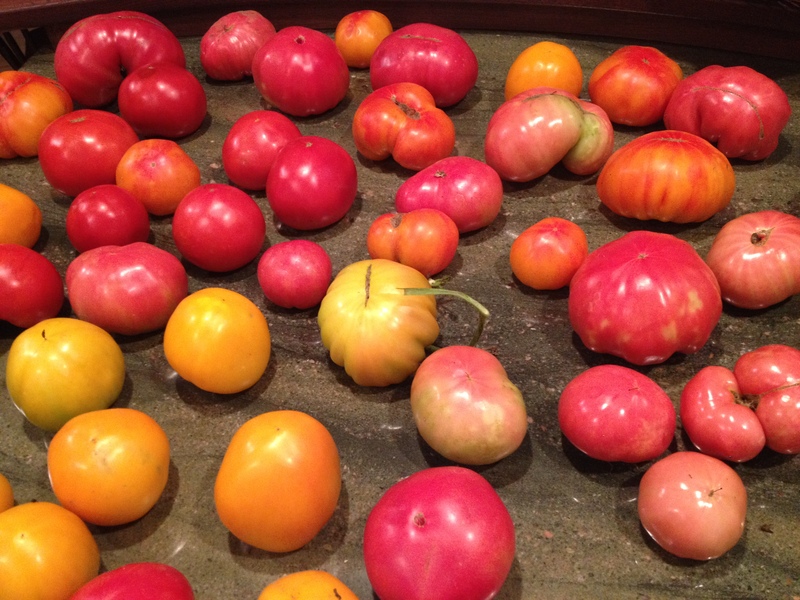 This was from the peak of the season when my garden was churning out tomatoes faster than we could consume! I planted all heirloom varieties. These are Valencia, Brandywine, and German Johnson. The variety of colors and flavors is wonderful and I just don’t think you can beat the sweetness of the old standards. So, what do I do with all these tomatoes? Salads, sauces and sandwiches! Mostly, I like to keep them fresh because this is the only time of year that I eat fresh tomatoes. I can’t stomach the mealy texture and flat flavor of the winter grocery store tomatoes (should we even consider them the same vegetable?). This is your standard tomato and mozzarella salad with basil and balsamic vinaigrette. Slice the tomatoes, any variety, and the mozzarella. Please use fresh mozzarella! I go to the local farm market for mine. It beats the hell out of packaged, processed stuff on the grocery store! The basil is from my garden too. Try growing your own. It is so worth it to be able to snip what you need without wasting any. The vinaigrette is equal parts good olive oil and good balsamic shaken up together. Now stack the tomatoes and mozzarella, top with chiffonnade of basil and drizzle with the dressing! 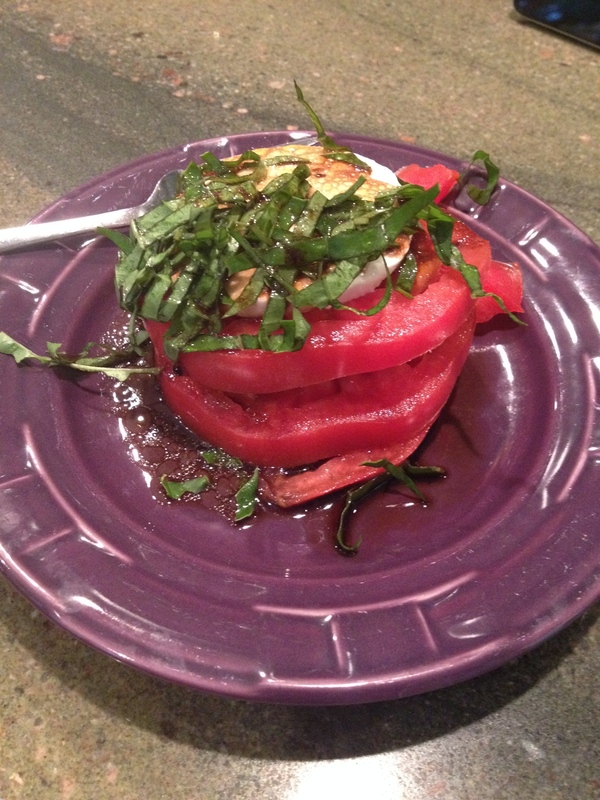 Below you will find a variation on the Tomato Mozzarella salad. 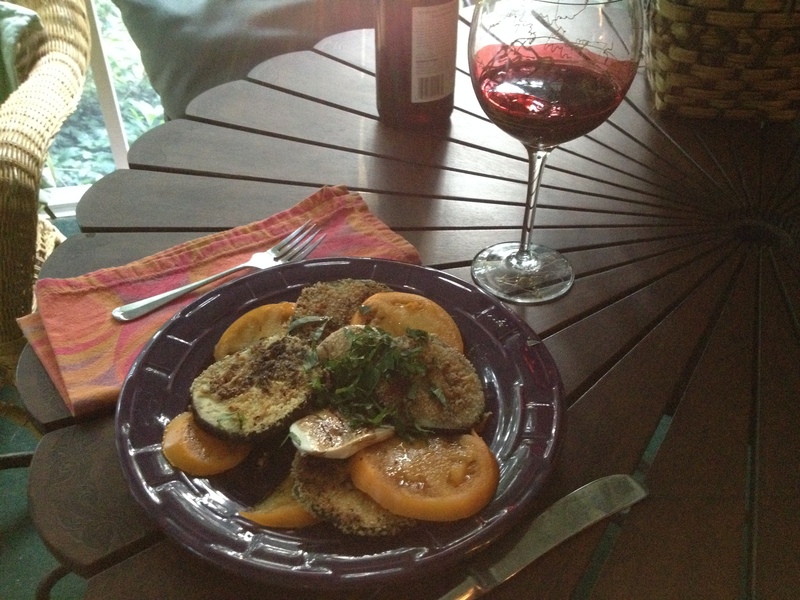 For this, I added fried eggplant from the garden. It’s great when you can go in your backyard for your meal! 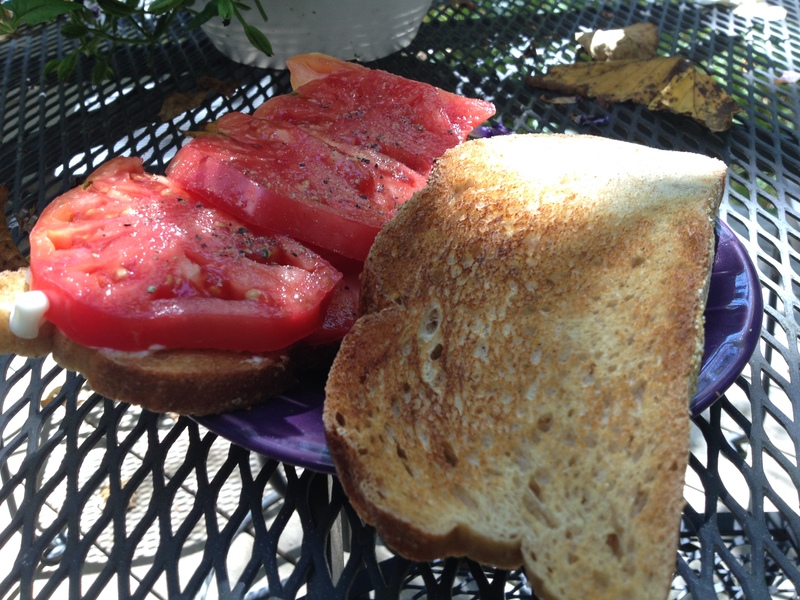 You have to love the tomato sandwich! Choose your favorite bread, favorite dressing and add thickly slices fresh tomatoes. This is simply the best! This is all of the Tomato Mozzarella Salad ingredients on a grilled pizza – including the dressing! 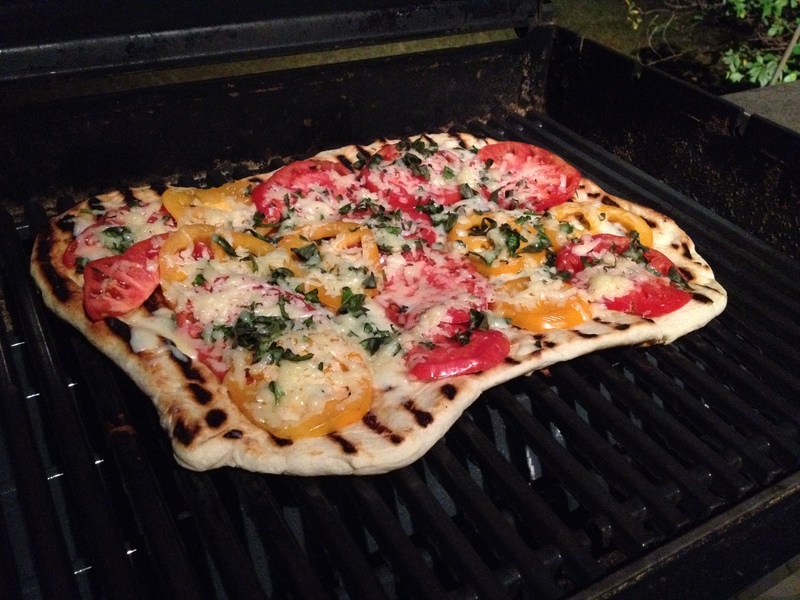 If you haven’t tried pizza on the grill, you are really missing out. Heat the grill to ~400 degrees. Roll out the pizza dough (my favorite is Bobby Flay’s recipe) and rub both sides with olive oil to prevent sticking. When the grill is hot, slap the dough on and close the cover. Immediately turn the burners down (I use gas which make this easy) to med low and make yourself wait about 5 minutes (unless you smell burning). Use the long spatula and flip the dough over. Add the toppings and close the lid again. This will take a little longer but check every few minutes to make sure it doesn’t burn. 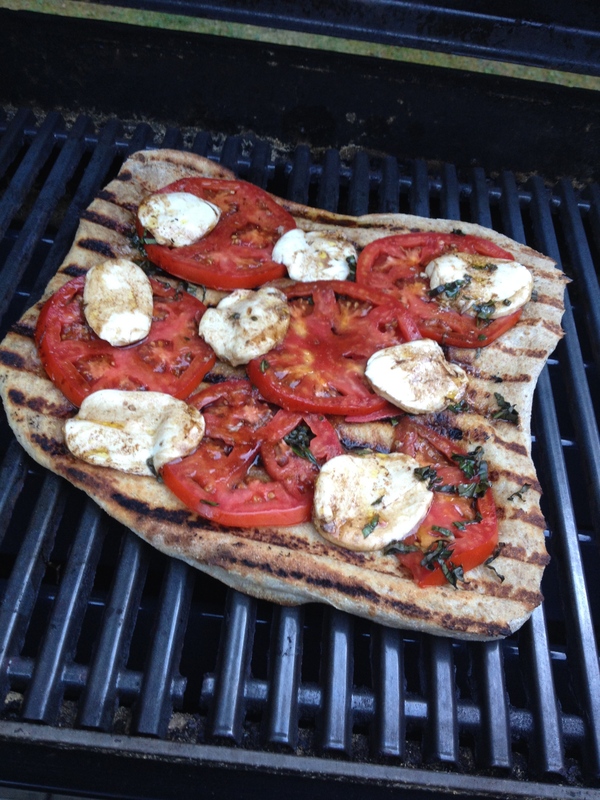 This was delicious – ripe juicy tomatoes dripping with flavor on crisp, chewy dough! The last, but equally wonderful is the Tomato Cheddar pizza. This time I didn’t want the tomatoes to be runny. So I sliced and salted them first, laying them between paper towels and put a board on top to weigh them down. While they drained, I got everything else ready. This is only tomatoes, basil and a bit of cheddar cheese. I cooked it exactly like the one above. The tomatoes were perfect, not too juicy but full of flavor. I hope you have all enjoyed the summer bounty of tomatoes as much as we have. We will certainly miss them but I am looking forward to soup and squash season! I wish I lived closer so I could come to your house for dinner!